Check out the blackboard. That box on the left has all of the information you need to know about one element. It tells you the mass of one atom, how many pieces are inside, and where it should be placed on the periodic table. In the next section we're going to cover electron orbitals or electron shells. This may be a new topic to some of you. Take a look at the picture below. Each of those colored balls is an electron. In an atom, the electrons spin around the center, also called the nucleus. The electrons like to be in separate shells/orbitals. Shell number one can only hold 2 electrons, shell two can hold 8, and for the first eighteen elements shell three can hold a maximum of eight electrons. As you learn about elements with more than eighteen electrons you will find that shell three can hold more than eight. 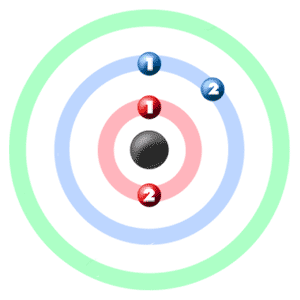 Once one shell is full, the next electron that is added has to move to the next shell. 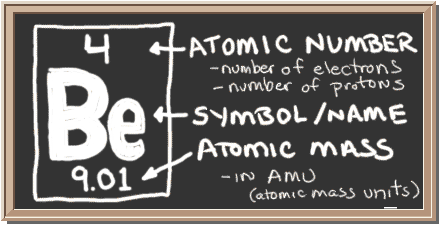 So... for the element of BERYLLIUM, you already know that the atomic number tells you the number of electrons. That means there are 4 electrons in a beryllium atom. Looking at the picture, you can see there are two electrons in shell one and two in shell two. ► More about the history and places to find beryllium. Two fluorine (F) atoms can also bond with one beryllium (Be) atom, making the formula BeF2. Beryllium gives up one of it's electrons to each of the fluorine atoms. The result give each of the fluorines eight electrons, making their shells full. 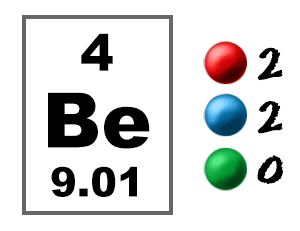 Two beryllium (Be) atoms are able to bond with one carbon (C) atom to create Be2C. The beryllium atoms let the carbon use their electrons so that the carbon is 'happy'. Each beryllium gives up both of its two extra electrons to the carbon. Take a look and see how all of the electrons are shared.